Cambodia is one of those places that is always a great value for travelers with American Dollars in their pockets. Hence, we've added it to our Top 10 Value Destinations for US Dollar Travelers for 2016. Don't wait! Sandwiched between popular the Southeast Asian destinations of Thailand and Vietnam, travelers have added Cambodia to their travel itineraries for years now, mostly because of Angkor Wat. While Angkor can and should be on your agenda (it truly is one of the world's great wonders), there is so much more to this country than the massive temple complex outside of Siem Reap. Read: 11 Reasons to add Phnom Penh to Your Trip. The people: The Cambodian people have been through a lot over the past 30+ years (really over the last 500 years), with the annihilation of a massive percentage of their population due to Pol Pot and the Khmer Rouge. Yet you wouldn't know it from talking to the locals, as they are as upbeat, happy, and positive as ever. A true inspiration just being around them. Seeing and understanding what these people went through is powerful and puts your own life into perspective. While it's not as renowned as neighboring Thailand and Vietnam, Cambodian food is excellent and underrated. Similar to other Southeast Asian cuisines, they still put their own unique slant on it. Much of the country still remains unexplored, making for some great independent travel possibilities. If you like bigger cities but don't like the absolute chaos of cities like Bangkok or Hanoi, Phnom Penh is a welcome respite with all the amenities of a big, bustling city but without the craziness. Costs, Angkor Wat aside, are still quite low. It's not very difficult to get by on $25 per day and be comfortable. While there's more to Cambodia than Angkor, that doesn't mean you should skip it. It truly is one of the most impressive sites in the world. Follow these tips to have an indie experience in Cambodia. There's so much more to Cambodia than Angkor Wat and the memorials surrounding Phnom Penh, so don't limit yourself to just those two destinations. Head to the seaside town of Kep for some water fun, but then head into the nearby hillside to check out the former French colonial retreat. These art deco mansions are in various states of disrepair after the Khmer Rouge ransacked them, but they are very cool to explore, especially on bike. Many travelers head for the coastal town of Sihanoukville at some point in their travels. If you find yourself there, take the hour journey to Bamboo Island for some really nice downtime. Not many places to stay, no internet, power only from 6pm-11pm, no hot water, no a/c. If you're looking to relax and get away from it all for a bit, this is a great place to do it. If you're looking for some eco-tourism opportunities, check out the Koh Kong Province in the northeast near Thailand. Practically inaccessible until just a few years ago, this area is starting to become popular, so get there now before the development overtakes it. Budget plenty of time for Angkor Wat. Too many people have a false assumption that Angkor is just the one big temple that is always seen in photos. But Angkor is a massive complex of over 1000 temples. It is said to have been the largest preindustrial city in the world, so if you just plan on jetting in and out in one day, you'll be missing a lot. If you want to escape the crowds, head about an hour outside Siem Reap and visit the temple of Beng Mealea. Because it is so far outside the city, it sees far fewer tourists yet is one of the bigger temples. It's largely unrestored and has jungle closing in around it. Think about splurging a bit on your trip to Angkor. Hiring a private tuk tuk driver and getting a solid, well thought out plan together for which temples to visit when is recommended, and you will get the most out of your visit. Read: Fear & Loathing in Cambodia. Cambodia has been through a lot over the past, oh, 500 or so years since the fall of the Angkor empire. Most come for Angkor, and deservedly so as it's one of the world's most impressive sites, and that is not an overstatement. 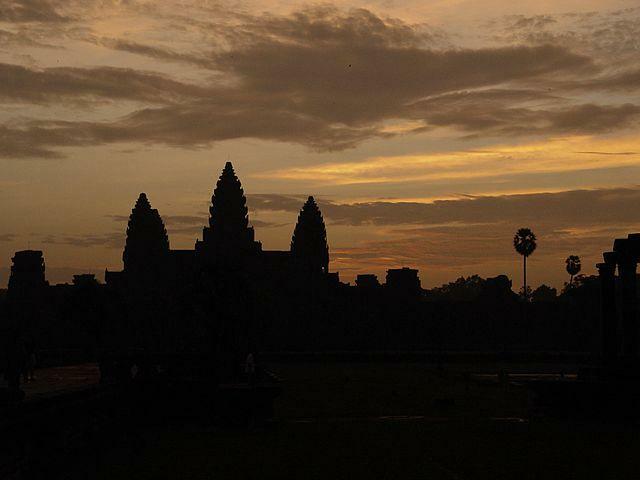 But while you absolutely should come to visit Angkor Wat, there is much more to be discovered. The people are an inspirational bunch, and I defy you to visit Cambodia, talk to the people, and not come away without a massive level of admiration for them. There is much to do and see in Cambodia - too much for a one-page guide like this - so make sure you check out Indie Travel in Cambodia for $25 Per Day to help plan your trip. Cambodia's most trafficked airport, Phnom Penh, is convenient to much of the country, although flying into Siem Reap will put you closer to the famous ruins at Angkor. Travelers from nearby countries often do not need visas to enter the country, anyone from a western nation will need to visit a Cambodian consulate and obtain a visa. For more on transport to and around Cambodia, read the Transportation section of Indie Travel in Cambodia for $25 Per Day. Hostels are widely available in Siem Reap and Phnom Penh. There are a few guest houses in the outlying areas as well, although the populations in the urban centers are still much more used to foreign visitors and tourists than any of the rural areas. Be sure to check out the accommodation section of Indie Travel in Cambodia for $25 Per Day for more in depth info, including costs.